This updated download contains four (4) ready-to-use economics activities. Each one includes teaching suggestions and a full-sized answer key. Just print and copy! 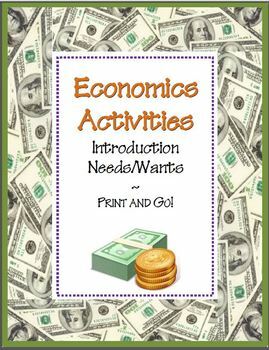 These fun and easy activities can be used to introduce, review, and/or assess common economics concepts. Two additional skill sheets focus on needs and wants. 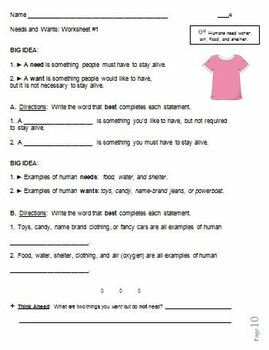 These activities include kid-friendly definitions of each term as well as clear, easy-to-understand directions, and graduated application. This product relates to the following CCSS standard(s). Please note that this list may represent only a partial list of all standards and/or strands that apply. -> Please check out the preview to learn more about how well this product will meet your needs. IMPORTANT NOTE: This resource has been saved in a format that allows for printing in high resolution. However, file contents may NOT be changed, copied, or extracted. This file is NOT editable. Thanks for stopping by to check out my products. If you like what you see and find it useful, PLEASE come back and leave me feedback. It would be greatly appreciated! 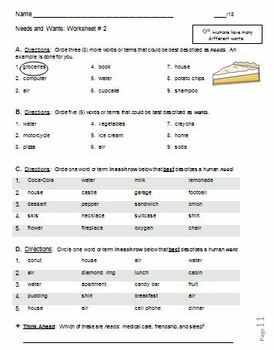 Economics Vocabulary & Activity Packet NO PREP! 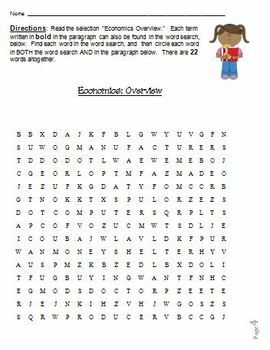 MORE Economics Vocabulary & Activities NO PREP! Follow me on Lessons4Now Facebook. Follow me on Lessons4Now Pinterest. Follow me on Lessons4Now Blog.